In a small bowl, combine all of the marinade ingredients. Place the pork and marinade in a nonreactive container and marinate at least 20 minutes. Preheat oven to 450. Splash the bottom of a roasting pan with olive oil. Sprinkle the onion slices over the center part of the bottom of the pan. Place the pork over the layer of onions in a roasting pan. Pour any remaining marinade over the pork. Meanwhile, whisk together the roasting liquid. Set aside. After about 1/2 hour, add the roasting liquid and cover with a lid or foil and lower the temperature to 325. Toss the apples and potatoes with a bit of olive oil, salt and pepper. Set aside. After an additional 45 minutes add the apples and potatoes to the bottom of the pan. 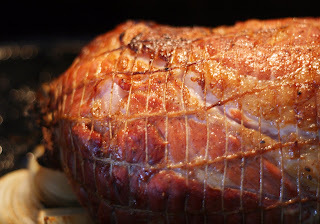 Roast until a thermometer inserted into the thickest part of the roast measures 160°F, about 1 1/2-2 hours. Allow to sit 10 or so minutes before removing the netting and slicing. 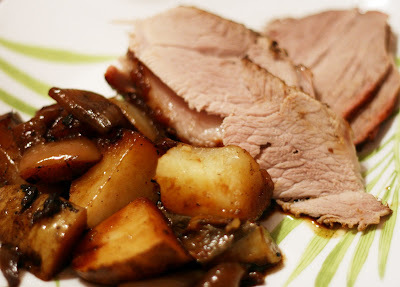 *Boneless pork shoulder roast is generally sold with some string wrapped around it or in netting. This holds the roast together and needs to remain in place during the roasting. If you can't find a boneless shoulder roast, use a bone-in and either debone and truss before roasting or roast it bone-in cut around the bone to serve. Bone-in meat will take longer to cook. The weather in Baltimore has suddenly turned from reasonably pleasant to down right uncomfortable: highs in the mid '40s and constant rain. In other words, it is the perfect weather to make this cozy, homey dish. Not only is it an extremely tasty (and seasonal!) one pot meal, it makes your whole house smell delicious. An added bonus is that the extended cooking time really heats up your house, especially if you, like me, haven't turned the heat on yet.